My name is Janey Kaiser and I am the coordinator for the Lonoke County Arkansas page. The PURPOSE OF THIS PAGE is to aid you in your search for Lonoke County Arkansas residents. It is hoped that the information contained here will help you better understand how and when the county boundaries changed, who some of the residents were, where Lonoke county information may be found and how to contact others that may be working on families of your same interest. In 1803, the Louisiana Purchase was acquired by the United States, and, in 1819, Arkansas was organized as a territory. Its northern, eastern and southern borders were the same as they are now, but to the west, some of what is now Oklahoma was included. Two years later, in 1821, the territorial capital was moved from Arkansas Post to Little Rock. In April, 1996, a group of genealogists organized the Arkansas Comprehensive Genealogy Database. The idea was to provide a single entry point for all counties in Arkansas, where collected databases would be stored. In addition, the databases would be indexed and cross-linked, so that even if an individual were found in more than one county, they could be located in the index. At the same time, volunteers were found who were willing to coordinate the collection of databases and generally oversee the contents of the web page. If you would like to host a county, in Arkansas, contact Betsy Mills. In March and April, 1996, a group of genealogists organized the Kentucky Comprehensive Genealogy Database. The idea was to provide a single entry point for all counties in Kentucky where collected databases would be stored. In addition, the databases would be indexed and cross-linked, so that even if an individual were found in more than one county, they could be located in the index. At the same time, volunteers were found who were willing to coordinate the collection of databases and generally oversee the contents of the web page. It is a genealogy volunteer site called Genealogy Look Up Forum. of look ups in many states such as Birth, Death, Census, Cemetery, Marriage, and obituaries. We need volunteers who are able to do look ups for our viewers. I will put your name here along with your email address. Look up Obits in the Cabot Area. Please visit this new page. We must never forget. April 16, 1873, the legislature created Lonoke County by taking land from Pulaski and Prairie counties, making it the seventy-first county in Arkansas. The legislative act designated the town of Lonoke as the county seat. Named by a railroad surveyor that used a massive red oak tree as a landmark. The final boundaries of Lonoke were realized in 1882. The boundary change added 100 square miles to the county, resulting in the addition of the town of Carlisle. The first officials of Lonoke County, appointed by the Governor were: Judge E. L. Beard, Sheriff J. M. McClintock, County Clerk George M. Chapline and Treasurer Anderson M. Russell. There has been three Courthouses in Lonoke County. On October 12, 1873, William Goodrum executed a deed for property for the consideration of $2,000. This property was to be used for the grounds of the first courthouse, located in Brownsville community. The first courthouse was formerly used as Prairie County's Courthouse, was torn down, moved, and rebuilt on the Goodrum lot. This two-story frame building measuring twenty-four by ninety feet, burned in 1881. Fortunately all of the county records were saved. Until a new courthouse was built, buildings were rented for the governmental purpose. The second Courthouse was built in 1885 for $15,000. This second courthouse was a two story brick structure two halls, five offices, a fireproof vault, a courtroom, offices on the second floor and a clock tower. This courthouse was torn down to build a larger one. The third and present courthouse was built in 1928, at a cost of $200,000. The stately building is a rectangular, four story structure with an exterior of red brick, white stone trim and an entrance portico of white columns. The interior of this courthouse still features marble, original tile floor sand some of the original lighting fixtures. Dedication Day for the new Courthouse was set for May 14, 1928. A full day's activities included a parade, singing from local groups, a picnic, a speech from Lonoke contain, Joe T. Robinson, who was running for Vice President of the United States, and the long awaited opening of the old cornerstone. The Courthouse was put on the National Register of Historical Places by the U.S. Dept. of Interior June 8, 1982. Lonoke County had the great fortune to have had four men from its midst serve as Governor of Arkansas. James P. Eagle served from 1889 to 1893; Joe T. Robinson served from 1912 to 1913; W.K. Oldham served in 1913 until the legislature adjourned, after Robinson had resigned; John E. Martineau served from 1927 to 1928, when he resigned to become a Federal District Court Judge in eastern Arkansas. Joe T. Robinson also served a total of ten years in the U. S. Congress and twenty-four years in the U.S. Senate. Lonoke County is still primarily an agricultural county. Areas of interest are the Joe Hogan Fish Hatchery, the Smoke Hole Natural Area, Toltec Mounds State Park, and Camp Nelson Confederate Cemetery. By the act of April 16, 1873, sections of Prairie and Pulaski counties were cut off to form a new county, which was named Lonoke. It is said the name was derived from a "lone oak" tree which stood on the site of the present Town of Lonoke and which was used as a landmark by George P. C. Rumbough when he was surveying the lands of the county. The act creating the county designated the Town of Lonoke as the seat of justice, and George M. Chapline, Thomas Doyle and William Goodwin were appointed commissioners, who, under the direction of the county court, were to purchase lots for the county buildings. The first courthouse was a building that had been used as the courthouse of Prairie County, but which had been removed to Lonoke from Brownsville. It was destroyed by fire in 1881, but the records were saved. The square where the present courthouse stands was donated to the county by C. T. Thompson and Walton Harris in 1875. Lonoke is divided into the following townships: Butler, Carlisle, Caroline, Cleveland, Crooked Creek, Eagle, Fletcher, Furlow, Goodrum, Gray, Gum Woods, Hamilton, Indian Bayou, Isbell, Lafayette, Lonoke, Magness, Oak Grove, Pettus, Prairie, Pulaski, Richwoods, Scott, Totten, Walls, Ward, Williams and York. The county is situated in the central part of the state. On the north it is bounded by White County; on the east by Prairie and Arkansas counties; on the south by Jefferson, and on the west by Faulkner and Pulaski counties. It's area is 807 square miles, drained by numerous creeks and bayous, and the soil is generally fertile. The first rice grown as a commercial proposition in Arkansas was grown in this county. Dairying is an important industry. 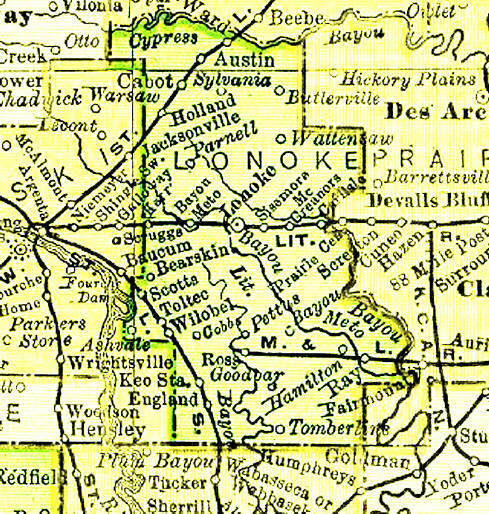 The first settlements in what is now Lonoke County were made in the northwest part. As early as 1821 Sampson Gray came from Tennessee and settled on Moss Prairie. He was followed by Francis Secrist, James Dunnaway, S. C. Moss, William Sanders, Sr., William Sanders, Jr., Drury Dobbins, James Erwin, Joseph Stillwell, John Reynolds, Hamilton Reynolds, Lot Johnson, Josephus Tucker, John Harrod and a few others, all of whom came to Arkansas while it was still a territory. Game was plentiful in early days, and the pioneers depended largely upon their trusty rifles to provide a supply of meat for their families. Andrew J. Legate, who came to the county in 1842, used to tell of killing five bears one morning before breakfast. The main line of the Missouri Pacific Railroad crosses the northwest corner, with stations at Austin, Cabot and Holland. The Chicago, Rock Island & Pacific runs east and west through the central portion, and the St. Louis Southwestern provides transportation for the southwestern part. The Pine Bluff & Northern runs southward from McCreanor on the Rock Island, six miles east of Lonoke. The population of the county in 1920 was 33,400, a gain of 5,417 over the census of 1910. Lonoke and England, the largest towns, are described in other chapters. Austin was incorporated on October 22, 1895, and in 1920 reported a population of only 163. Carlisle, on the Rock Island nine miles east of Lonoke, was incorporated on July 1, 1878. It is a banking town, has a weekly newspaper, foundries and machine shops, a rice mill, a telephone exchange, general stores, and a population of 602. Cabot, on the Missouri Pacific, was incorporated on February 22, 1897. It has a weekly newspaper, a bank, two nurseries, a telephone exchange, etc., and a population of 477. Keo, an incorporated hanking town on the St. Louis Southwestern, has large lumber interests, general stores, etc., and a population of 325. Butlerville, Kerra, Pettus and Tomberline are thriving villages and local trading centers. Lonoke is Located in central Arkansas. Lonoke County was created in 1873 from Pulaski and Prairie counties. Its name was derived from the "Lone Oak" tree that stood at the site of the town of Lonoke, the county seat of government. Within its boundaries are numerous creeks, bayous and fertile land for agriculture. Lonoke, Cabot, Humnoke, England, Carlisle and Keo are thriving communities in Lonoke County. Lonoke is Positioned 34.78 Degrees North of the Equator and 91.89 Degrees West of the Prime Meridian. We have a new way of posting our Query's. I hope this makes it easier. I hope this helps in your search for that certain link to your family. When you go to this site just click on the first letter of the surname you are searching for, it will take you to the surname. Just click on the surname and it will take you to the query. I hope this makes it easier for everyone in their search. The archived queries are the only one set up this way. You may search for a name in Lonoke County with this link. We are adding new pictures all the time. Please visit. Hope your family came this way? Head of Household for 1880 Census, Lonoke Co.
See also Ark. birthplaces not assigned to counties. Carlisle: J. F. Gillespie, Jr.
See also Ark. areas not assigned to counties. Submitted by Janet Schaible. Thank you Janet for your wonderful site. Located off Hwy 319 near Ward, AR. Some pictures have been added. This is a old cemetery and on private land. Their are pictures of before clearing and after. Flynn Cemetery as of 1995. That is the latest List I have. Located Next to Sylvania Presbyterian,2419 Arkansas HWY 321 N. Ward, AR. in Lonoke, Co., AR. Transcribed from reading Headstones in the Cemetery. These are just a few listings in this Cemetery. This is where we start information on the War's. If you have a Relative or any Information from Lonoke County and would like to submit to the War Pages, please email their names and information to Janey Kaiser and I will add your information to our pages. Be sure and include what War they were in. Thank You. "Arkansas Confederate and Union Soldier's Burial Place"
in Lonoke and Prairie Counties. Check it out if you think you might be a descendant. This Site is from Jim Welch. His research focuses on Lonoke Co. Families and contains Family Tree's and Photos. Arkansas that lets you search the records by County. 1842, 1850, 1852 and 1871! This will take you to Shelia Brannon's Map Page. Be sure and visit her home page, she has some neat information that may help you no matter what county you are interested in. To return to this page you must use your back command on your browser. These maps are beautiful. you can click and zoom to any part and they print out very well. what you will find. You can zoom in close enough to count the windows in a building. 14 beautiful full color maps that load fairly quickly. State Health Department has birth and death records from 1914 and marriage records from 1917, divorce records from 1921. Clerks of counties where license was obtained have marriage records. The Clerks of Circuit Courts also have records of wills, deeds, divorces, and war service. Joy Fisher for providing access to the Arkansas land records. Betsy Mills for providing access to the Arkansas Counties Boundary Maps; 1842, 1850, 1852, 1871. Shelia Brannon for providing access to the Arkansas Counties Boundary Maps; 1819, 1836, 1850, and present. John Robertson for providing access to the Historical County Lines Maps of all the U. S.
You are the[an error occurred while processing this directive]Visitor since May 9, 1999.